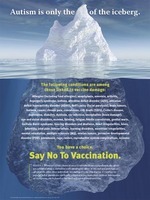 Open people's eyes to the dangers of vaccination. This chart reveals the full impact of vaccination in our children. Allergies (including food allergies), anaphylaxis, anorexia, arthritis, Asperger's syndrome, asthma, attention deficit disorder (ADD), attention deficit hyperactivity disorder (ADHD), Bell's palsy (facial paralysis), brain tumors, bulimia, cancer, chronic pain, convulsions, crib death (SIDS), Crohn's disease, depression, diabetes, dyslexia, ear infection, encephalitis (brain damage), eye and vision disorders, eczema, fainting, fatigue, febrile convulsions, genital warts, Gullain-Barré syndrome, hearing disorders and deafness, heart irregularities, hives, infertility, joint pain, kidney failure, learning disorders, menstrual irregularities, mental retardation, multiple sclerosis (MS), ovarian tumors, pervasive developmental disorder (PDD), pneumonia, rage, rashes, reproductive system complications, seizures. Additional notes about the spectrum of vaccine damage and freedom of choice are printed on this great visual aid to spreading vaccination truth.